What sort of exhaust specialist should you put your trust in? Tony Green is possibly the most experienced Grand Prix race bike exhaust engineer in the UK today. He's made custom exhaust pipes for many of the greats - including Jock Taylor, Egbert Streuer, Steve Webster, Derek Jones, Trevor Ireson, Steve Abbott, Ron Haslam, Harald Bartol, KRP, SP125, DTR and many other GP and TT winners from the 70's through to the present day. A racer from the late 60's until the early 80's himself, supplied by Barry Sheene's father, Tony really understands the racing point of view. Tony left his tool-making job at Pressed Steel in Swindon in Jan 79 to start the company, and built custom exhausts for friends who raced bikes and sidecars. After Jock Taylor won the 500cc world championship sidecar race in 1980 using Tony Green pipes - and after Egbert Streuer and Steve Webster won 5 more world championships using Tony Green pipes in the 80's - Tony quickly developed a reputation as a leading engineer and craftsman in racing. Many further European, South African and UK championships were won using Tony's pipes. 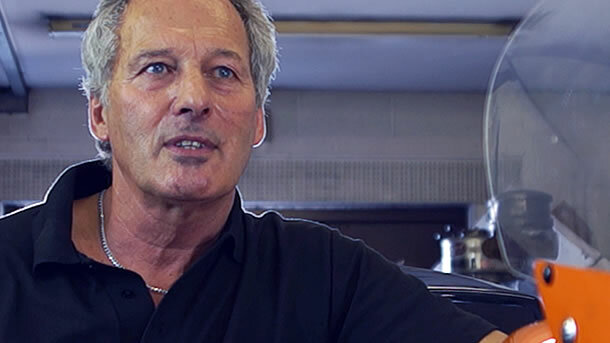 In the 80s Tony was instrumental in the development of expansion chamber engineering and to this day is one of the foremost experts in the field. Slowly Tony evolved his own leading approach to developing pipe dimensions. Every year, he continually improved, matching new dimensions and techniques to new engines and racing constraints. When Tony started fabricating exhausts, the classic bikes of today were then brand new racing machines. And over the years, Tony has built his experience of both design and competition, which he now brings to his services for classic racers. With the emergence of the classic 2-stroke market and the resurgence in 2-stroke racing, Tony Green Racing is now more busy than ever supplying racers, teams and collectors. We're not cheap, but because we offer phenomenal experience and top race performance, we provide unbeatable value. Call Tony on 01793 854 770. All our work is hand-crafted, lovingly designed and thoroughly tested by experts. Every pipe that leaves our workshop is tuned for optimum performance on the track. We serve collectors, enthusiasts, riders and racing teams from all over the world. It's easy to book your bike in. Just call us on 01793 854 770 and we'll book a slot for you.